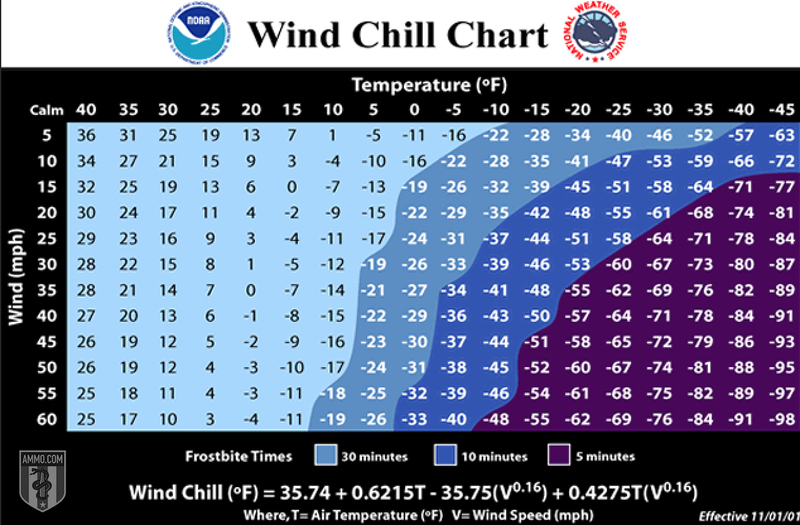 The National Weather Service uses a specific, complicated formula to determine the wind chill temperature, or T(wc), that goes like this: Multiply the current temperature by 0.6215, then add 35.74. From that total, subtract 35.75, multiplied by wind speed to the .16 power. Now take that total and add it to 0.4275 times the temperature, multiplied by the wind speed to the .16 power. And that gives you the wind chill temperature. Simple, right? An easier way to find out the wind chill temperature is to turn on a National Weather Radio (NWR), which reports the weather from the National Oceanic and Atmospheric Administration (NOAA). Reported from the closest National Weather Service office nearest you, the NWR plays 24 hours a day, seven days a week, reporting all local weather forecasts, warnings, watches, and hazardous information. Let’s look at an example of the wind chill effect. Say the temperature is 40 degrees. When the winds blow at five mph, the wind chill feels like 36 degrees. When the winds kick up to 20 mph, the wind chill drops to 30 degrees. When the temperature is 25 degrees, a five mph wind creates a wind chill of 19 degrees. 20 mph winds make it 4 degrees. When the temperature reaches zero, five mph winds make the wind chill -11. And when the gusts blow at 20 mph, the temperature feels like -22 degrees, which is cold enough to cause frostbite within 30 minutes. Wind chill advisory: A wind chill advisory means BE AWARE, cold weather is expected. Wind chill watch: A wind chill watches means BE PREPARED, dangerously cold temperatures are possible. Wind chill warning: A wind chill warning means TAKE ACTION, very cold air and strong winds are occuring, frostbite and hypothermia are possible. Limit time outside, dress in layers, and don’t expose skin to the elements. The National Weather Service also issues winter weather advisories, indicating that snow, ice, freezing rain, or sleet can make outside conditions extreme, that travel will be difficult, and to only travel if it’s absolutely necessary. 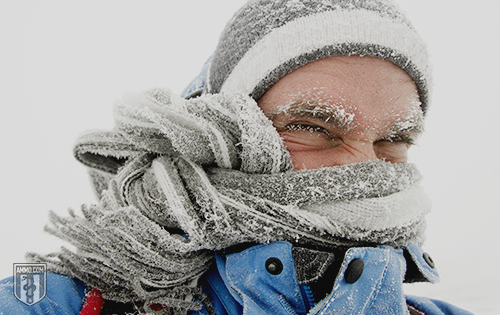 When exposed to extremely cold temperatures and high winds, the body loses heat faster than it can generate, which leads to health emergencies, primarily hypothermia and frostbite. Hypothermia occurs when the body loses heat too quickly, uses all its stored energy, and the core body temperature begins to drop. Hypothermia effects brain function and causes people to struggle with clear thinking, problem solving, and movement. Their judgement becomes so impacted, they may not realize what’s occurring or know that they’re cold. Frostbite occurs when the skin is exposed to frigid temperatures, causing the tissues to freeze. It most often impacts the nose, ears, cheeks, chin, fingers, and toes, and causes a loss of feeling and color. It’s mild form, called frostnip, causes the skin to turn bright red and creates an ache. When extreme, the loss of color and numbness of frostbite can become permanent. In the worst cases, amputation is sometimes necessary. Although frostbite can impact anyone, those with bad circulation have the highest risk. When extremely cold weather hits, it’s often accompanied by winter storms, which can lead to large accumulations of snow, ice, and freezing rain. These conditions make travel difficult and dangerous. Each winter, over 500,000 motor vehicle accidents result from winter weather. These types of winter storms can also knockdown power lines and shut down the power grid, leaving millions of people without power and, if they’re not prepared, without heat. 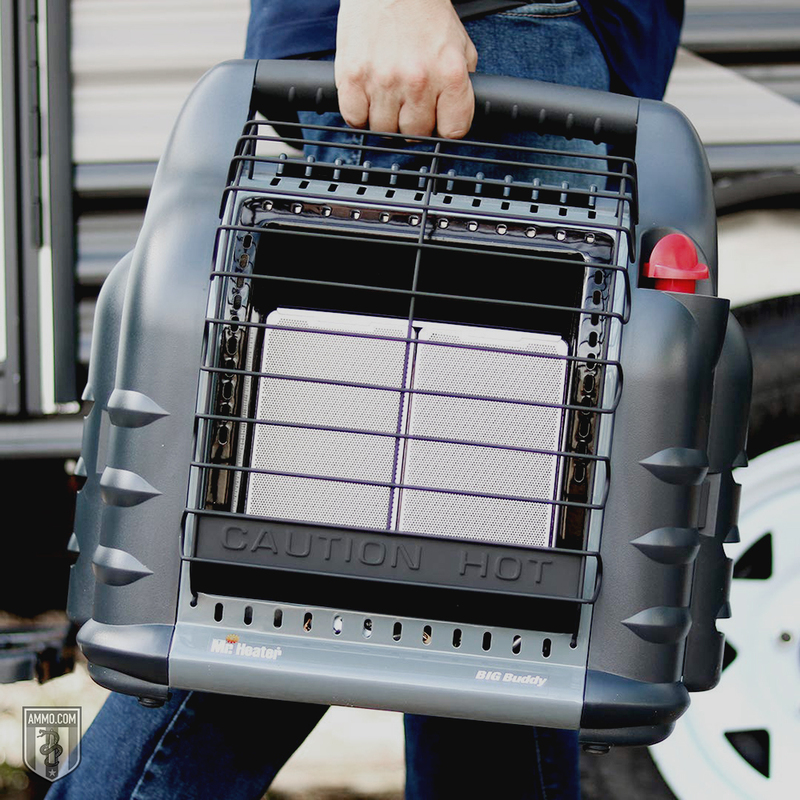 This creates a risk for carbon monoxide poisoning, especially as people run generators for electricity, and house fires caused by portable heaters. The number-one thing you can do to protect you and your family against the extreme cold is to plan ahead and prepare long before the cold winter hits. The type and extent of preparation depends on your location and the types of extreme weather that occur there. After all, those who who live in upper Michigan must prepare in a very different way than those in Louisiana. If you’re in the U.S., it doesn’t matter where you live – there’s a risk for extreme cold, which means you should prepare with a cold weather survival kit. 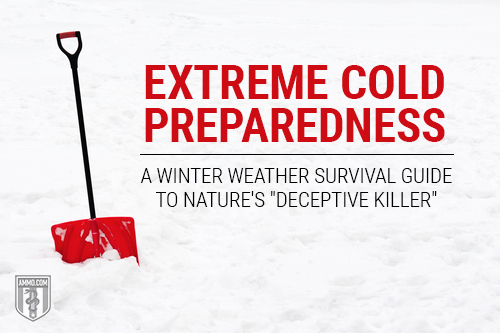 An extreme cold survival kit is much like a general emergency kit or disaster preparedness, but with a few specific items that may not generally be included. Before each winter season, spend a few minutes going through the contents of the emergency survival kit, replacing and adding whatever items are needed. If children live in the house, be sure to include specialty items you may need – like diapers, baby formula, and baby food. For older children, make sure to include a few board games, a deck of cards, and a book or two to entertain them and keep them from going stir crazy if the family gets snowed in. Don’t forget about your pets! Include any medications the animal would need and be sure to have enough food to get through the storm. Although three days of food and water are recommended for the winter emergency kit, more provisions are recommended – especially if you live in an area prone to significant snowfalls, prolonged cold snaps, or are extremely rural. Clean your gutters and remove any dirt and debris, which can cause ice to build up and lead to roof and gutter damage. Inspect the chimney and, if necessary, clean it or hire a chimney sweep to do it for you. Check your smoke detectors and, if necessary, change the batteries. Install a carbon monoxide detector – this is a dangerous gas that has neither taste nor smell and often goes undetected until poisoning occurs. Purchase an easy-to-read thermometer to make it easy to track indoor temperatures – this is especially important with the elderly, who may not feel the temperature change. Insulate your home’s water lines, installing heat tape in areas prone to freezing. Use storm windows, plastic, weatherstripping, and insulation around windows and doors to eliminate drafts. Keep your gas cans full and don’t let your vehicle get below a half a tank of gas – this not only keeps you prepared, but reduces the risk of ice forming in your fuel lines. When temperatures drop well below freezing, you may want to leave your faucets dripping and open your under-the-sink cabinets to prevent the lines from freezing. When cold weather is approaching, watch the weather to ensure you know the forecasts and have plenty of time to prepare. Once it hits, stay inside as much as you can and limit travel. When extreme cold arrives, your primary heat source may not be enough to keep your home warm, especially if strong winds are present. If you must use secondary heat sources, be sure to follow all safety precautions. Heaters that use fuel, such as kerosene and propane, may require ventilation to allow gas byproducts to escape. With electric space heaters, ensure they’re at least three feet away from furniture, curtains, and blankets, which become fire hazards. Do not heat your home with the oven or stove, a grill, or any gas-powered outdoor heater. To ensure the most effective use of heat, close off unnecessary space, this is especially important during power failures. Pull curtains closed and shut bedroom doors, hang blankets over windows and open door frames, and place rolled up towels under doors to block drafts. If you have an infant, be sure to keep their room warm. Babies can’t create body heat by shivering and their bodies struggle to maintain temperature in cold rooms. Drink warm, sweet beverages to keep the body warm, or boil broth and sip it. Avoid caffeinated beverages and alcohol, which can quicken the speed at which the body loses heat. If at all possible, avoid going outdoors in extreme winter weather. When it’s necessary, minimize both your time and trips outside and make sure to dress appropriately. Wear loose layers and cover as much of your skin as possible with hats, scarves, face masks, and mittens. Wear insulated boots and cover your mouth and nose to protect your lungs from the cold. Base layer: Wear a moisture-wicking base layer to remove perspiration from your skin. The most effective fabrics for base layers include synthetics like polypropylene and polyester, or natural fibers like silk or merino wool. Mid layers: Wear mid layers that are loose and insulating, trapping body heat. Opt for fabrics made from nylon, non-bulky fleece, merino wool, or down. Outer layer: Wear a shell outer layer that protects you from from the elements and closes against your body at the cuffs and bottom. Choose a fabric that’s tightly woven and resistant to both wind and water. Do your best to stay dry and if you start to sweat, slow down. If necessary, remove a layer of clothing before it gets damp with sweat. While doing outdoor chores, such as snow shoveling, take regular breaks so you don’t overexert yourself. Instead of shoveling the snow and lifting it to move it, push the snow. It’s just as effective and less strain on your body. When heavy snowfall is expected, stay on top of the snow shoveling by going out every few hours and removing a few inches at a time, instead of waiting until there’s eight inches or more on the ground. When outside, pay attention to your body and what it’s telling you. If your body starts to shiver and doesn’t stop, it’s time to go inside and get warm. If you start feeling strained, work slower. Exerting yourself in the extreme cold can be dangerous and can put an extra strain on the heart. Those with heart disease or high blood pressure need to be particularly careful when doing physical activity in extremely cold weather. Each year, at least 100 people have a heart attack and die while shoveling snow. Both frostbite and hypothermia are real concerns in the extreme cold. If you notice any warning signs, take action immediately. In infants, who don’t yet have the ability to shiver, the signs of hypothermia include bright red, cold skin and very low energy. At any point the body temperature falls below 95 degrees, it’s an emergency and immediate medical attention should be sought. If you’re concerned that you or someone you’re with has hypothermia, begin warming up the body right away. Get the person into a warm room or shelter. If their clothing is wet, remove it. When possible, use electric blankets or blankets warmed in the dryer to increase the temperature, focusing on the body’s center, including the chest, neck, head, and groin. Use body heat to warm the person by providing skin on skin contact under loose, dry layers. Don’t give the person any alcohol or caffeine, instead opting for warm, sweet beverages or broth. If the person is unconscious, do not give fluids. When it comes to frostbite, the affected extremities often hurt and turn red. As the condition progresses, their coloring turns white or greyish yellow and the area in question becomes numb. The skin begins to feel firm or waxy. As soon as the signs of frostbite appear, check for hypothermia immediately, as it’s more life threatening and needs to be addressed first. If frostbite has affected the toes, try not to walk on them, as it could create more damage. Bring the person into a warm room and submerge the damaged area in warm, not hot, water. Use body heat to warm the cold tissue by placing the cold extremities between the thighs or under the arm. Since the tissue is frozen and fragile, don’t rub or massage the skin, as it can cause more damage. And don’t warm the hands with a heating pad, lamp, or fire. Because the skin is numb, the skin is likely to burn. When extreme winter weather hits, you should only leave home if you absolutely have to. If you must go, be sure to share your travel plans with someone not going with you, check in at predetermined times and when you arrive at your destination. That way if something goes wrong, someone will know an approximate location to send help. You can check local travel and road conditions by calling 511. Before extreme weather hits, ensure your car has a winter tuneup. Have the brakes and the exhaust system checked. Change the air and fuel filters if necessary. If you live where snow and ice occur, opt for winter tires, not all-weather, which are not designed for bad winter roads. Check your antifreeze, oil, and lights throughout the season. In situations where you may become stranded in your vehicle, either due to an accident or driving conditions, it’s often best to stay with the car or truck, as it provides a shelter from the wind and elements. If you have enough gas, run the vehicle’s motor 10 minutes every hour. Crack a window to let fresh air in while the vehicle is running and turn up the heater. If snow starts to pile up around the vehicle, periodically dig out the exhaust. Tie a bright-colored cloth to the antena, which will blow in the wind and be less likely to get covered in snow. If it’s not snowing, pop the hood of your vehicle to make it more noticeable. If you have to get out of the vehicle to get things out of the trunk, do it in one trip. Wrap yourself up in as many layers as possible, using every resource you have including blankets, tarps, clothes, and even things like newspaper. Don’t forget to cover your head. If other people are with you, use body heat to your advantage. Share blankets and stay close together. Remember that movement creates heat and keeps your blood circulating, so don’t be afraid to move your arms and legs. It’s also important to stay awake. Move around. Tell stories. Sing. Do whatever you need to do keep yourself awake. Once you fall asleep, it’s easy to become too cold without realizing it. If it’s too cold for you outside, then chances are it’s too cold for your pets and livestock. Dogs and domesticated cats should be brought inside. Livestock need adequate shelter where they can get out of the elements and wind. In extreme cold, some animals may require heat lamps to survive. Be sure to provide plenty of food, as it requires significant amounts of energy to keep the body warm during extreme cold. Provide fresh hay for grazing animals, as it takes longer for the hay to digest than oats or grain. If livestock waterers don’t have a heater, provide fresh, unfrozen water at a minimum of twice a day to keep the livestock hydrated and healthy. 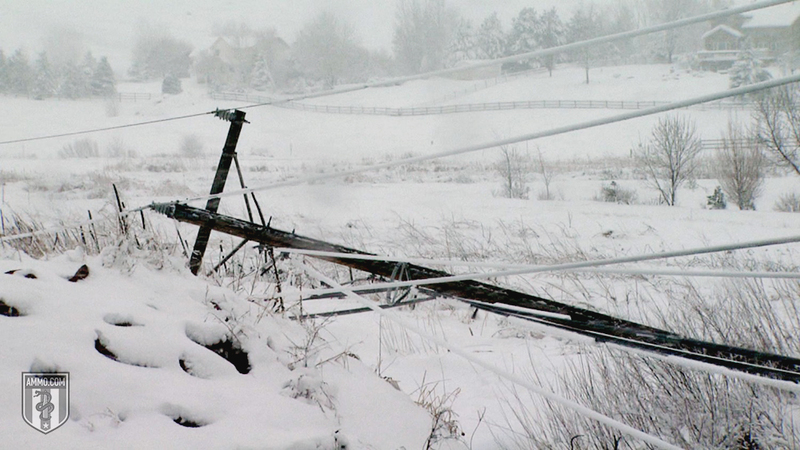 Winter storms are known for heavy amounts of snowfall and high wind gusts, making power failure a real possibility. And, for many people, a loss of power also means a loss of running water and electricity. If there’s snow, finding fresh water isn’t too difficult. You can melt snow over a fire, in a pot or metal can. Bring it to a boil and let it go for one minute. This kills most microorganisms and parasites, and makes it safe for human consumption. Electricity and heat, on the other hand, can be more difficult to obtain. When running a generator, be sure to keep the device outside and away from any windows. The exhaust leaks through cracks and can lead to carbon monoxide poisoning, which leads to 20,000 emergency room visits and an estimated 430 deaths per year. In situations where the power goes out and you’re unable to heat part of your home or the house has sustained damage that makes staying warm impossible, find some place safe to stay. Ask your neighbors for help until you can find a solution. Local non-profit and faith-based organizations are often the first to help in emergency shelter situations. You can also text “shelter” and your zip code (Shelter 90210) to FEMA’s text line: 43362. If you’re participating in outdoor activities in the cold, such as cross country skiing, snowmobiling, or hiking, special precautions must be taken. In addition to your vehicle survival pack, you’ll also want to pack dry clothing, a two-way radio, a billy can (used for boiling water), waterproof matches, and firestarters. When engaging in winter recreational activities, again, share your plans with someone at home and touch base regularly. Even if you have no intention of spending more than a few hours in the wilderness, you should know the basic skills necessary to survive in the wild – including how to make an emergency shelter and multiple ways to start a fire. Making it to your vehicle is the best case scenario, even if heavy snowfalls make driving impossible. 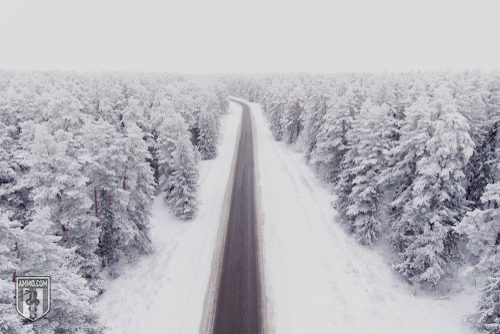 In many cases during extreme cold winter storms, staying in your vehicle is your best option, especially when there’s poor visibility or during ice storms when the roads become treacherous. If you’re stuck in the woods, make a shelter and use pine boughs or saplings to get you off the ground. Improve your visibility by making words in the snow with branches or bright colored clothing. Once the extreme cold and winter storm pass, it can take a few days before the snow melts, the roads are clear, and power is fully restored. If you have elderly or disabled neighbors, check on them to make sure they weathered the storm okay. Shovel the snow off your sidewalks and plow the driveway. If the winter storm caused any damage to your house or property, take pictures and contact your insurance company. Once the aftermath is over, review your winter weather emergency plan. What worked well and what needs to be reevaluated? 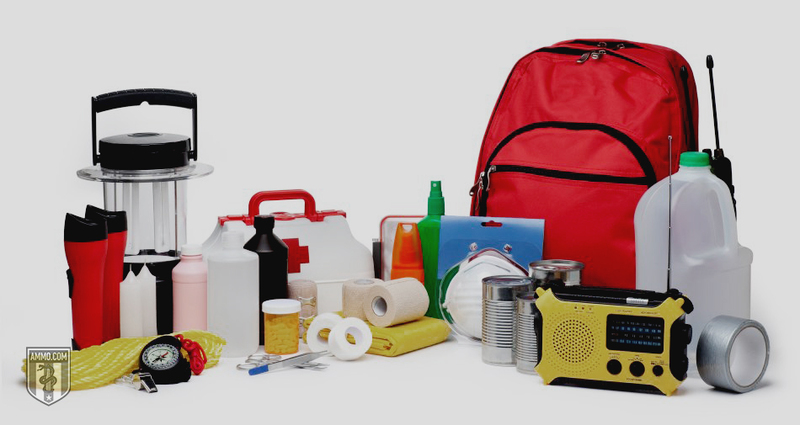 Restock the items you’ve used so that next time a big storm hits, you’ll be ready.